Dried flower news! For the fastest updates, tips and news, see us on Facebook & Twitter - see links below. Sign up for our occasional newsletter with hints, tips, comments and stock updates. New lines are regularly added throughout the year. FREE download of Lavender Craft! My Dried Lavender hints & tips eBook with recipes, makes and more is now available as a 27 page PDF to download via my blog. Or buy Lavender Craft for only 99p from Amazon. Doing our best to be ethical wedding suppliers! Bringing fair and pleasant wedding planning to all! We always try our best for our customers. Tiny air dried rose buds in ivory or bright red. 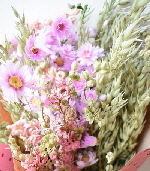 These are pretty dried flowers for potpourri, weddings & craft. We have some lovely photos of Steve & Shelley’s spring wedding. They used dried flower confetti of hydrangea petals and delphinium petals with confetti cones & stand. The same high quality & great fragrance as ever! for hints, tips & makes. We’re very pleased to be able to offer English grown lavender! now available - retail and wholesale. Loose rose petals Burgundy, red, ivory or pink available in a selection of weights. Wedding favours Lots of unusual ideas beautifully presented. Dried flowers Visit this department for ingredients for making your own pot pourri. Dried lavender A perennial favourite. To buy any of the products on this page, just click on the Enter Shop button to visit our online shop at www.daisyshop.co.uk where you can browse our range and pay securely.